Turkey Book Talk episode #69 – Amy Spangler on the life and work of Sevgi Soysal, whose classic 1973 novel “Noontime in Yenişehir” she translated into English. She also discusses co-founding the literary agency AnatoliaLit and her work on “Seher,” a collection of stories penned in jail by former HDP co-chair Selahattin Demirtaş. Here’s my review of the (great) novel from a few weeks ago. Maureen Freely joins to discuss the tragic life of author Sabahattin Ali and her translation of his classic 1943 novel “Madonna in a Fur Coat,” just published in a first ever English edition by Penguin. Check my review of the book at Hürriyet Daily News, previously published in the Times Literary Supplement. Support the Turkey Book Talk podcast with a per episode donation via Patreon – Many thanks to current supporters Özlem Beyarslan, Steve Bryant and Andrew Cruickshank. I’m breaking my blogging hiatus to present a guest post by my friend Paul Osterlund, who is currently reporting for Today’s Zaman. The piece is a response to a recent apologia for the Turkish government’s press freedom record written by Sabancı University historian Adam McConnel on the Serbestiyet website. Rebuttals are welcome via the comments section. Late last month, an article titled “Understanding the Turkish Press” appeared on the Turkish website Serbestiyet (The Independent), written by Adam McConnell, an American historian who has lived in Turkey for 15 years and holds a doctoral degree from Istanbul’s Sabancı University. Despite the website’s moniker, Serbestiyet is comprised primarily of self-fashioned “liberal” journalists and scholars who support President Recep Tayyip Erdoğan and his ruling Justice and Development Party (AKP). The website features a cadre of columnists who previously wrote for the Taraf daily, who subsequently jumped ship when that paper adopted a harshly critical stance toward the AKP. These columnists range from those who are unwavering in their support for the AKP to those at who are at least willing to acknowledge many of its authoritarian blunders, nevertheless insisting that the party is Turkey’s only democratizing force. In his essay, McConnell writes that the Turkish press is a “daily anarchic knock-down, drag-out free-for-all,” where the is no semblance of objectivity, but rather a ragtag collection of pro and anti-government dailies eschewing proper journalistic standards for cheap potshots. While this may be true, it forms the basis for his assertion that “the Turkish press is not under threat from the government, and is not censored,” a position that could only be occupied by one wearing blinders. His idea of a free press resembles Erdoğan’s views on democracy, which Turkey’s president believes in firmly rooted in the ballot box. So long as there are multiple parties competing in relatively free and fair elections, no one has the right to complain. As long as there are a variety of papers taking aim at the government, the opposition, the Gülen movement, and each other, the press should be considered free and healthy. Such logic painfully overlooks a variety of important factors. One troubling trend that McConnell neglects to mention is Erdoğan’s penchant for publicly chastising journalists. The president has done this time and time again knowing that the journalist in question will receive a deluge of threats. In 2011, Erdoğan accused respected columnist Nuray Mert (without specifically mentioning her name) of supporting the Kurdistan Workers’ Party (PKK). Afterwards, Mert lost her job as a TV show host and was eventually booted from her columnist position at the daily Milliyet. Most recently, Erdoğan singled out professor and columnist İhsan Yılmaz, (though again not by name) calling him a traitor for various remarks Yılmaz had made at a conference in Washington earlier this year. Both Mert and Yılmaz reported fearing for their safety. These are only two among a host of similar incidents. (Erdoğan seems particularly eager to target young female journalists, including Amberin Zaman, Ceylan Yeğinsu, Selin Girit and Rengin Arslan). The author proceeds by listing the most prominent Turkish dailies and their respective ideological stances, pointing out that the majority are critical of the government. He takes opposition papers to task for suddenly beginning to cover labor issues, a move which he says amounts to “nauseauting hypocrisy.” Never mind that labor conditions have deteriorated amid a major construction boom and privatization frenzy that has coincided with the AKP’s tenure as Turkey’s ruling party. Even if it is hypocritical for the opposition papers to revert their focus toward these issues, they have become impossible to ignore, particularly when they are surrounded by hysteria and provocation caused by the AKP itself. An Erdoğan advisor, Yusuf Yerkel, was photographed kicking a protestor following a deadly mine disaster that killed 301 workers at the Soma mine in May. Erdoğan himself caused a furor when he said the tragedy was the “nature of the business,” referencing similar disasters in 19th-century England. In the midst of such absurdity, only papers loyal to the government failed to report on these incidents, the kind of scandalous and popcorn-muching fodder that is dream coverage for newspapers. 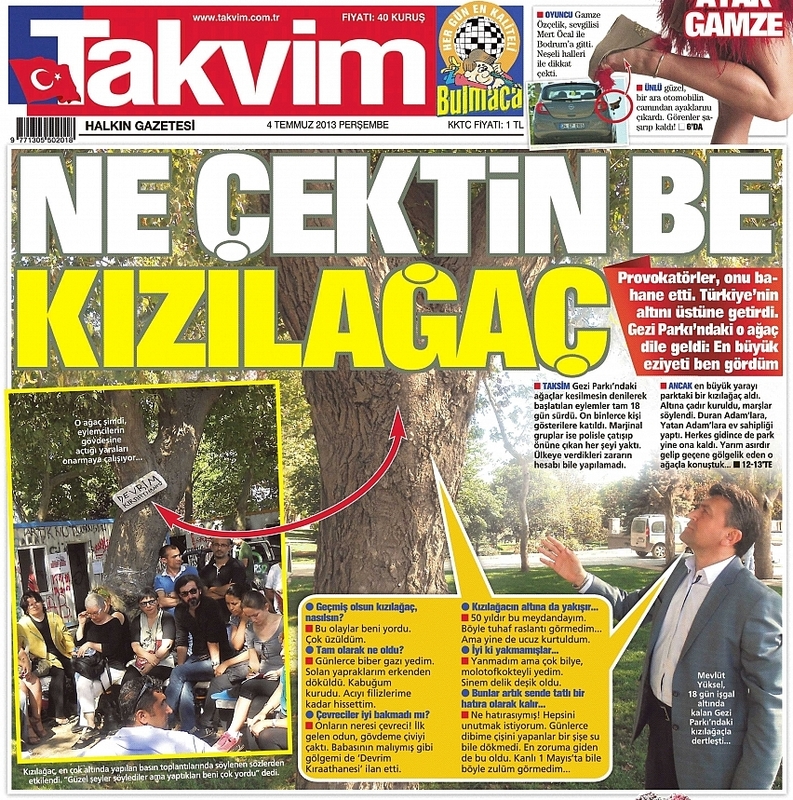 Pro-government tabloid Takvim‘s legendary interview with a tree during last year’s Gezi protests. Pressure from the ruling party can even have the power to dramatically influence circulation between the opposition papers. After Hürriyet opted not to print a highly sarcastic piece from Yılmaz Özdil, one of the country’s most popular columnists, Özdil jumped ship to Sözcü, which then immediately took Hürriyet’s spot as the third-most circulated paper in Turkey, moving up from fourth place, although the two papers have traded places since then. Amid increasing pressure from the government, Hürriyet declined to print Özdil’s column as it suggested in a facetious manner slathered with bitter mockery that Erdoğan’s son Bilal should be the country’s prime minister. In their columns, the Serbestiyet crew has exhibited an extremely paranoid attitude toward the Gezi Park protests, asserting that the movement had been hijacked by Kemalist/neo-nationalist forces. They argued that the protests amounted to a “coup,” and they evaluated the Dec. 17 corruption scandal using the same term. Even the Oct. 6-7 clashes between PKK sympathizers and Islamist groups over Turkey’s indecisiveness over Kobane have been referred to as a coup by some of these columnists. One would think that people who have lived through actual military coups, as tanks rolled through the streets and forcibly seized control, and where dissidents were imprisoned, tortured and killed, would not throw around the term so lightly. They also managed to gloss over the large number of journalists who lost their jobs following the Gezi events. Since they believe any serious threat to the credibility of the AKP must be a coup plotter or secular nationalist, they harbor the same stance toward the opposition press. Any paper or writer who criticizes the government is a bitter, coup-sympathizing elitist who doesn’t understand a monumental social transformation that only the AKP could usher in and see through. Since McConnell would like his readers to believe that the opposition papers solely exist to take jabs at the AKP, he attempts to minimize their distinct ideological positions and deemphasizes the fact that they are catering to different groups of people. One wouldn’t find an average reader of Sözcü thumbing through the pages of Taraf, as the latter frequently features columnists openly and frankly discussing the Armenian Genocide and the Kurdish settlement process, occupying positions uncomfortable for your average Kemalist. On the other hand a loyal Taraf reader would likely snub their nose at the idea of reading Cumhuriyet or Yurt. (McConnell makes the claim that Taraf has become co-opted by the Gülen movement, a rather conflated accusation that many of its former columnists have echoed. While Taraf’s Mehmet Baransu and Emre Uslu are movement sympathizers, the paper also features gay and trans columnists alongside a host of other writers that would be unwelcome at the Gülenist papers.) Moreover, a reader of Zaman or Bugün, who sympathizes with the Gülen movement, would be unlikely to give Sözcü or Cumhuriyet more than cursory glance, even if Zaman has begun to reference Cumhuriyet reports. Different opposition papers have specific reasons to criticize the AKP. Left-wing papers such as BirGün and Evrensel go after the government because of its crony capitalist tendencies and sweeping neoliberal urban redevelopment initiatives. The Gülen dailies have come out swinging because the AKP has publically vowed to wipe out the Gülen movement and have taken major initiatives to destroy its financial integrity. The Kemalist dailies sling mud at the AKP whenever they can because they see it is an affront to their “secular lifestyle” and what they interpret as the “secular legacy” of the modern Turkish state. The pro-government press, on the other hand, exists for a solitary purpose: to act as the mouthpiece of Erdoğan and the AKP. These outlets come in different flavors, but they are all equally loyal in their unquestioning devotion to the president and the government. On several occasions, pro-government dailies have featured nearly identical headlines, indicating that they are the result of top-down instructions. If the present state of the Turkish press can be considered an all-out slugfest between papers that have very distinct reasons for taking potshots at the government and the pro-government press, it is because these conditions have been fostered and encouraged by the government’s polarizing rhetoric, zero tolerance policy regarding criticism, its eagerness to personally single out “troublesome” journalists and its encouragement of corporate allies to buy media outlets to broaden the range of its mouthpiece. The current condition of the Turkish media cannot be understood separately from the ever-increasing authoritarian maneuvering of Erdoğan and the AKP. The Turkish press, like the country it tries to represent, is highly dynamic and full of twists and turns. But despite the fact that Turkey can technically be considered a democracy, it is not a healthy one. And while pro and anti-government papers may duke it out freely with obnoxious headlines that often amount to little more than insults, the Turkish press is far from free. For one to begin to “understand” the Turkish press, they must be aware of the constant and diligent interventions staged by Tayyip Erdoğan, conducted to intimidate and delegitimize any and all who rattle his cage. In the state of insanity that Turkey is currently experiencing, the media has suffered more than its share. ‘News’ papers and TV stations that don’t observe news values and instead aim for perception management – or, more accurately, black propaganda – have become routine.I have held the same position at Star for years, but I feel there is no longer any possibility there to do responsible and balanced journalism. One wonders why it took so long to come to this conclusion, but Ertuğrul candidly explained his thoughts to T24‘s Hazal Özvarış. Star is one of the pillars of the friendly new media establishment that has developed around Turkey’s ruling Justice and Development Party (AKP) since it came to power in 2002. As comes through in the interview with Ertuğrul, it sees itself as more intellectual that the higher-circulation Sabah, though you have to ask just how highbrow a title featuring bi-weekly columns from PM Erdoğan’s economic advisor and telekinesis-detector Yiğit Bulut can be. Along with its sister TV station, Kanal 24, Star was bought by businessman Ethem Sancak in 2007, with Sancak declaring soon afterwards that he had entered the media sector “to serve the prime minister.” Kanal 24 is now equally devoted to the government as Star, and is probably even more influential, reaching a much wider audience while remaining just as partisan. After selling both off in 2009 (having made the necessary editorial adjustments), Sancak bought them back last month. Star’s front page headline on May 4, slamming Washington-based think tank Freedom House for it’s recent press freedom report describing the Turkish media as “Not free.” The subheading says Freedom House has links to “Israel lobbies” as well as “famous speculator George Soros,” while the text underneath emphasises that its president, David Kramer, is a Jew. Back in 2007, Sancak declared himself “lovesick for the prime minister,” adding that Erdoğan was his “most important idol.” He is one of the wealthiest and most prominent members of the AKP’s new constructocracy, with economic interests intertwining closely with the political interests of the government. Money can’t be made from owning a newspaper, but Sancak knows that owning an AKP-friendly media company is a necessary overhead to win contracts in other areas, (just last week his firm won the tender for armoured vehicle and bus manufacturer BMC). My colleagues at Star used to jokingly call me “Brother ethics” because of my concern about journalistic principles. I used to hold many of the same ideals as the AK Parti government, but when the party started to abandon these principles, the media that is close to the government also started to follow the same path. My first realisation of this was during the Gezi protests. I went to Gezi and so did my children. I had the opportunity to see both the groups using violence, and also those with ordinary, democratic demands. For this reason I found the attitude taken against Gezi by the government and the government media very disturbing. There was a complicated process during the “Kabataş assault” story during Gezi. At the editorial meeting I came out and said this story was fantastical and unconvincing. Many other editors expressed similar views. I said it was wrong to publish news without any evidence at all, based only on the claims of the young headscarved mother. But I couldn’t prevent the story from being published … After the camera footage emerged showing what really happened in Kabataş we even debated writing a formal apology at the editorial meeting; but as the prime minister’s attitude became clearer, this became impossible to publish. I had already been objecting to a lot of things, and my objections were always taken into consideration. However, by the end the number of these objections being considered dropped … We had a responsibility to the public before our responsibility to Erdoğan. But that threshold was passed long ago. In the government’s media there is no need for “Alo Fatih” calls interfering in the editorial process. There, people already know the reflexes of the prime minister and the government. In this sense, Star is a comfortable newspaper … The editors know what they have to do, what will or will not upset the government. There’s a kind of shared mind-set that doesn’t exist in somewhere like Habertürk, for example … I can’t speak for elsewhere, but I can speak clearly about the situation in Star. [PM Erdoğan’s economic advisor] Yiğit Bulut is a writer there, and before he was a TV station’s director; [Erdoğan’s political advisor] Yalçın Akdoğan also writes in Star. Both of them very regularly visit the newspaper. Therefore, caricature-like “Alo Fatih” phone calls are not even necessary at Star. The issue isn’t just about patronage. These newspapers also have directors. If we look at just bosses, we can see that Yeni Şafak’s boss has his own personal agenda. For example, despite the prime minister’s support, Yeni Şafak ran a campaign to prevent Mehmet Görmez from becoming the Religious Affairs minister. For some reason or another, the paper’s boss doesn’t like Görmez. In other newspapers, the most important thing is to consider which minister or which prime minister’s assistant they are close to, and what kind of closeness they have. It’s possible that many journalists are supporting the government both out of the opportunities this offers and also because they share its ideology. The AK Parti has created its own ideology; call it AK Parti-ism or Erdoğanism. The business environment is connected to the government, so is the media, so is the judiciary, so is the bureaucracy. This is a summary of the Turkey of Tayyip Erdoğan’s dreams. A coterie has developed that uses the political and economic opportunities provided by the government. In the media at the moment there are people supporting the government, but a large number of these will curse Erdoğan when his government declines. There are a lot of people behind him who have no real sympathy for him. During the Gezi protests and especially after Dec. 17 [corruption probe] there were dozens of headlines that unfortunately didn’t conform with proper news criteria and were published for propaganda purposes. It’s no longer difficult to see how the government is the source behind a lot of news and a lot of journalists. Sabah, Yeni Şafak, Star, and Akşam haven’t published a single line about the claims in the Dec. 17 investigations. There hasn’t been a single piece of news about what the claims actually were. At the same time, we read propaganda in the government media about the Gezi protesters’ “global terror links,” about Israel being behind Dec. 17, and even debates about the Gülen movement’s Islamic-ness. There were a lot of former police chiefs, bureaucrats, and politicians found guilty in the Ergenekon and Balyoz cases who started to feature in Star headline stories just because they took the same positions as the prime minister. People like Emin Aslan, Sabri Uzun, Hanefi Avcı. Once upon a time the accusations against them were widely reported in the newspaper. As that was the case, what were we doing back then? And what are we doing now? While I still worked at Star, I struggled to keep doing the things that I believed were correct in the name of journalism. I asked myself whether I should quit, or stay and struggle. In order to change things you must struggle. I objected to what was being done, I did what I could, and when I saw that I wouldn’t be able to do it any more I quit. I wondered about whether the insane atmosphere in Turkey would end after the local elections in March … But I saw how the country and Star became even harsher after the elections.